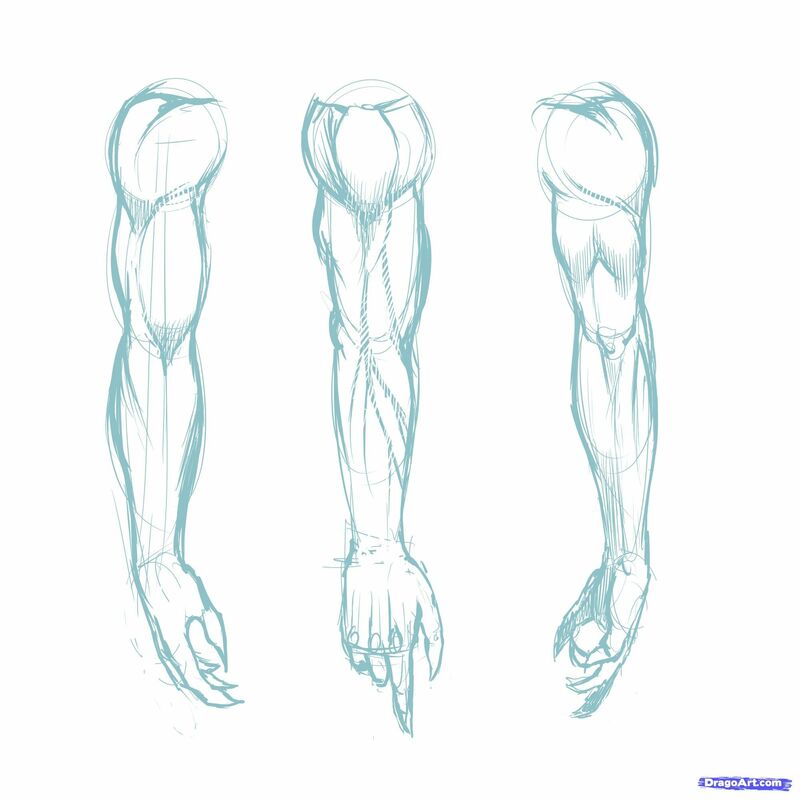 For the biceps and triceps area, I will draw a tube for each arm. This tube will become narrower on the bottom. Here will be connected to the elbow. If you are working with pencil and paper, you can use a kneaded eraser for erasing the dummy’s sketch without removing it completely. In my “Recommended Art Supplies” section you will a list of the supplies I use when working. There you will find the kneaded eraser I use when drawing. -The interior side. This side will have a similar distribution. It will present a curve line on top and another one under. The curve line on top will be longer than the one on the exterior side, but still shorter if we compare it with the curve line bellow that follows until it reaches the feet. Like I told you my objective here is to draw a well-proportion dummy. 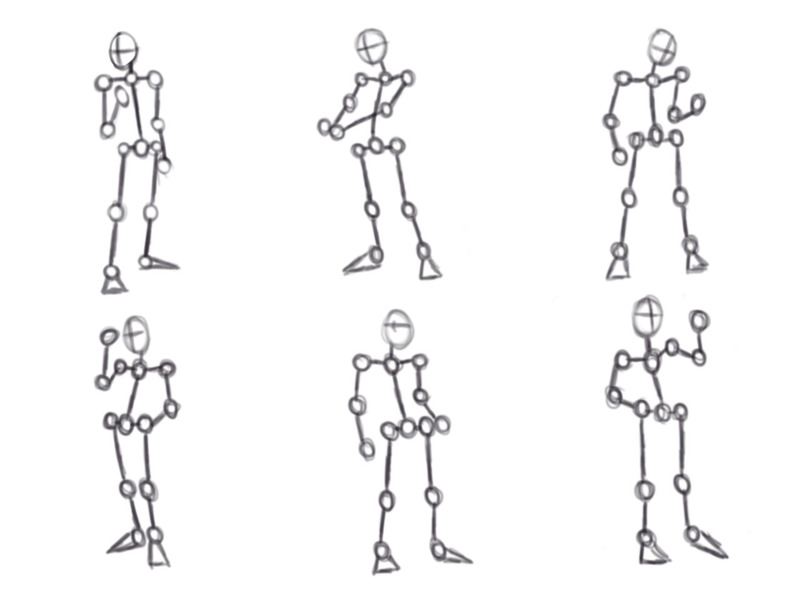 Teaching my students I realize for beginners is much easy if we focus on creating a dummy instead of going for muscle groups when drawing a person. Newbies tend to focus on drawing perfectly the biceps or the pecs and forget about the big picture: a well-balanced proportions. -The exterior side. This side will be drawn with a very short curve line on top and a long curve line under, which will end on the feet. As you already notice, one head is the distance between the base of the neck and the lower chest line. I always start drawing the torso. 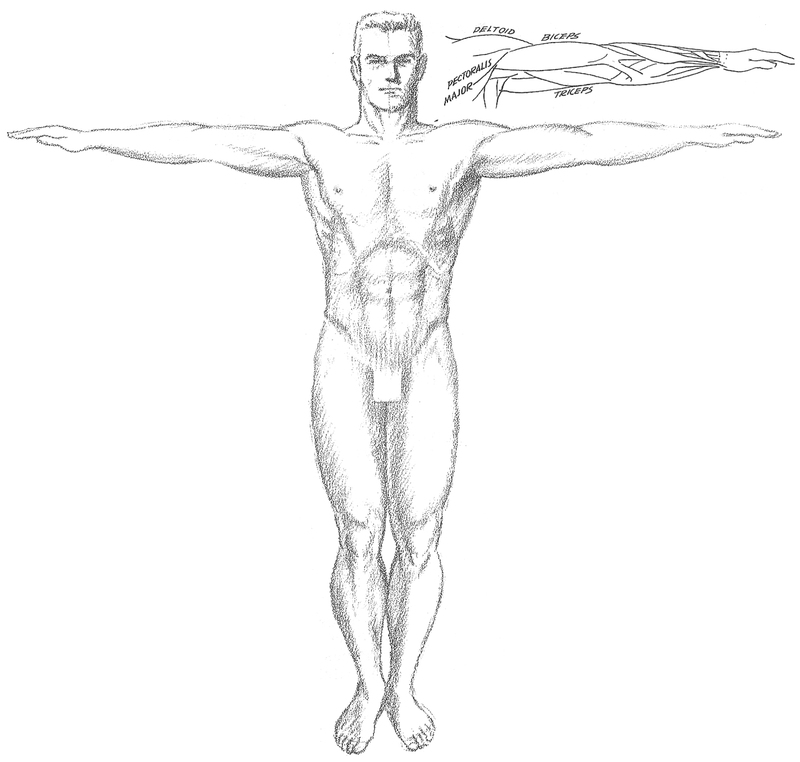 The reason is that the torso dictates the whole position of the body. 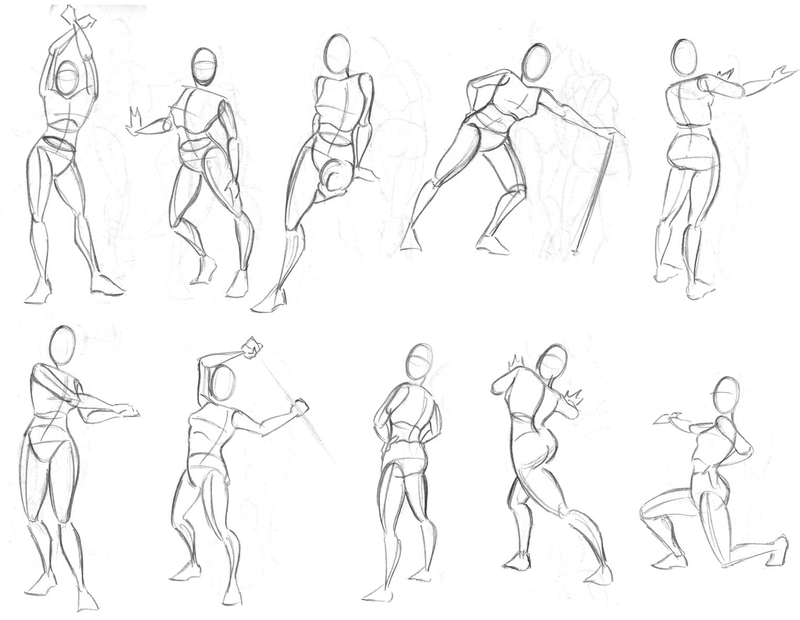 Once you have the torso and the hips placed, to draw the head and the limbs become way easier. Because we are drawing our character from a 3/4 view, both divisions of the torso will have different sizes. The nearest side to the viewer will be bigger and the farthest will be smaller. As you can see in the image above, I placed 8 heads, one on top of each other. Those 8 heads will represent the ideal human body proportions. They will help us measuring the different parts of the body. When drawing the dummy’s feet we didn’t draw any toes. I didn’t do it before because I wanted to keep your focus in drawing correctly the general body proportions. But don’t worry, drawing the toes is quite simple. Start drawing the big toe on the interior side of the tip of each foot. From there you should place the rest of the toes in succession. Remember the second toe, near to the big one, is almost as long as it’s bigger brother. From this second toe, you should draw the other 3 in succession and each one shorter than the previous one, and one behind the other. We will draw a horizontal curve across the sphere. This curve will cross the middle of the sphere and will define where the eyebrows will be placed. Following this same line, we will draw the ears on the side of the sphere. Then we will divide the whole head with another vertical line. Remember our head is in a 3/4 view, so both parts will have different sizes as we did for the torso. What is 3d sculpting ? Which are the best 3d sculpting programs ? This time the distance from the crotch to the kneecaps will be 2 heads. First of all will be the shoulders. I’ve seen many people drawing the shoulder like a couple of egg-shaped spheres. In my case, I do the same, but I also like to draw the top part of this inverted egg flatter. The reason is this allows to the descending line of the traps to continue on the deltoids. The result is a more natural and fluid body line. For not over complicate this process too much, I will draw the hands as two fists. I will draw them quite schematically. For the fist placed frontally we will draw a big irregular square for the palm. The fingers will be drawn as little rectangles. Let’s take the deltoid muscles for example. As you can see, the didn’t draw fully the division between the bottom of the shoulders and the biceps and triceps. I preferred to suggest them instead. This will give a more realistic feeling to your drawings. Later on, you can define better the fingers, the knuckles, etc.. but for now is more important to focus on the big picture and have a well-proportion figure in general. Below the knees, we will find the shins and the calves. This lower part of the leg will be drawn differently depending on the position of the legs. Take notice the distance from the belly button to the crotch area equals another head. 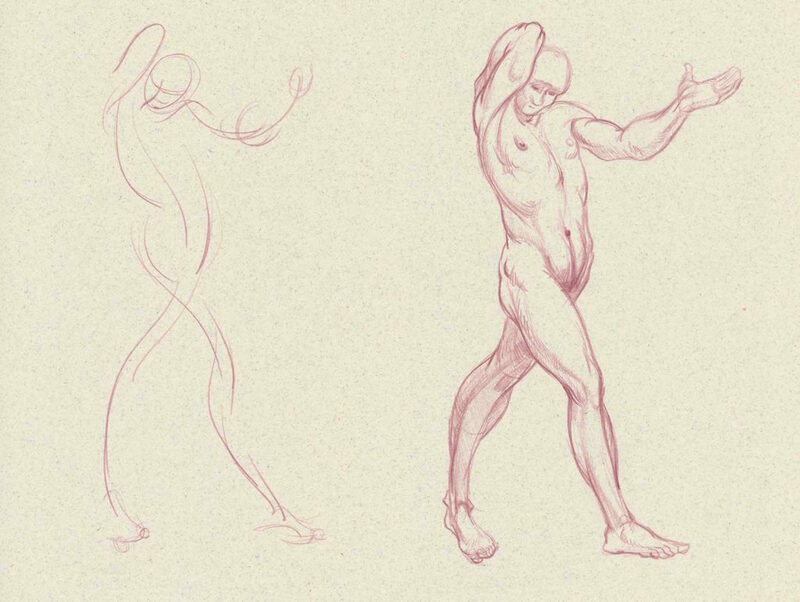 When drawing the body you gotta follow the underlying structure we created when drawing the dummy. 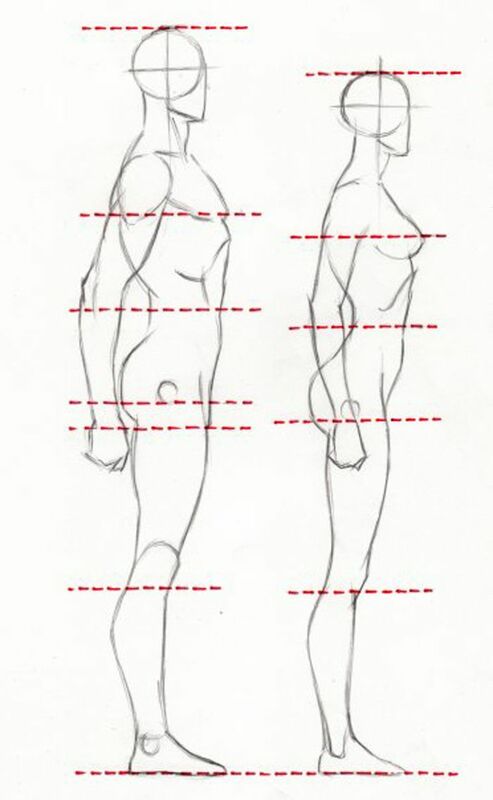 If you follow the original proportions, drawing the anatomy will become quite easy. Nevertheless, you can find some trouble when drawing the hands and the feet, mostly due to the fingers and the toes placements. 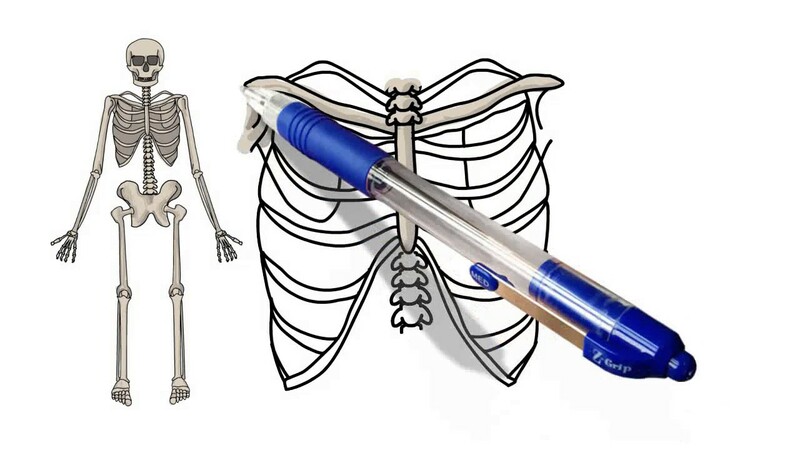 For the forearms, we will draw also a tube for each arm. Like before, they will become narrower on the bottom part. In this case, the bottom part will be the wrist. More or less, both wrists will be aligned with the crotch on the hips area. My main goal of starting this blog was to help those who are seeking answers to the same questions I had when I was a junior artist years ago. If with this articles, l can help you to avoid some of the mistakes I did, when I was starting my career, and maybe give you some artistic insight, it will be worth the effort. 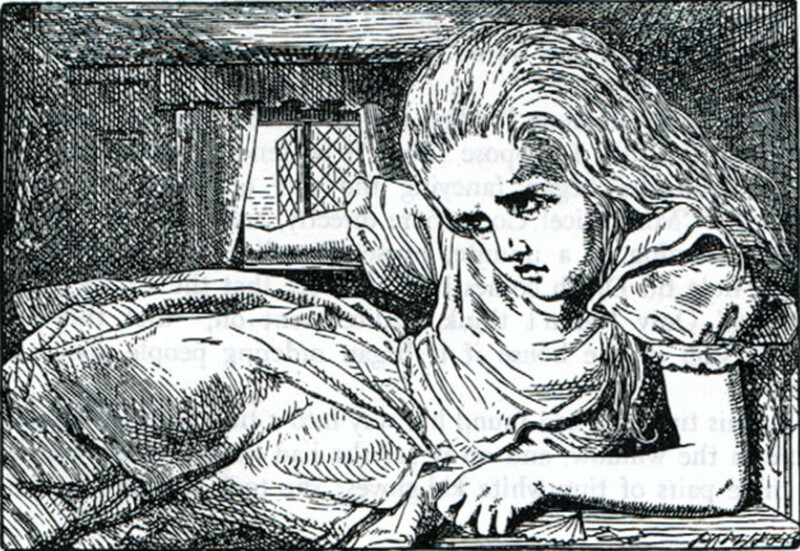 Due to the nature of the posse of the head, the eyelid of the farthest eye will be drawn as a narrow curve and the one from the closest eye will be drawn wider. This tutorial can be followed no matter what medium you use, traditional or digital. In any case, if you wanna know more in-depth info regarding which materials I´ve been using through my professional career, feel free to check my article on “Recommended art supplies”. Regarding the feet placed almost sideways, the only toe fully visible will the big one. The other four will be barely visible behind their big brother. Now let´s go more in depth and explain each step of the tutorial. But, before we start, you need to understand the importance of proportions. When drawing the face you should start following the vertical line in the middle of the dummy’s face. The middle point between the eyebrows and the chin will be where the nostrils of the nose will be placed. The middle point between the nostrils and the chin will be where the lower lip will be located. 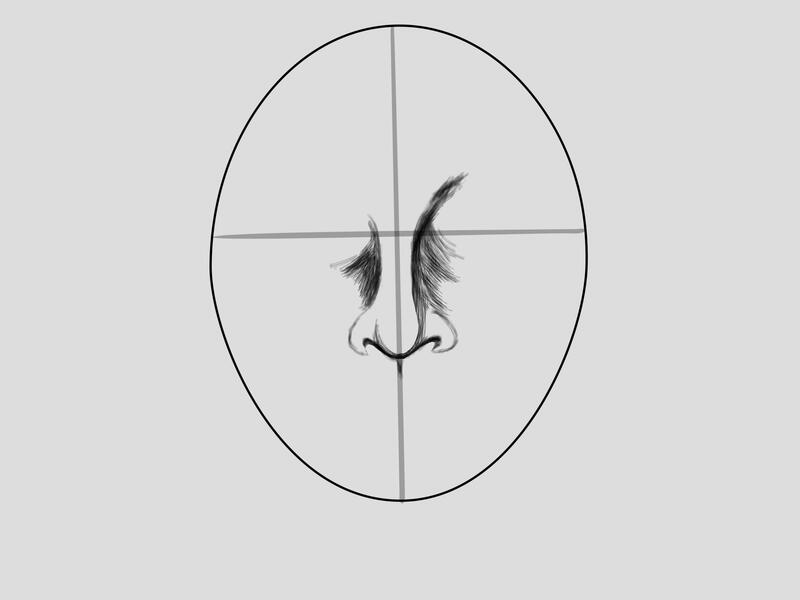 The eyes will be drawn as two curves for the upper eyelids. A circle with a dot inside, representing the iris and the pupil, will be drawn under each eyelid. As a final comment on this section, I want to highlight the fact that the distance from the lower chest to the belly bottom will be another head. If all this sounds a little bit confusing in the begging, don’t worry just keep practicing, keeping in mind the fundamentals I’m showing you in this tutorial. 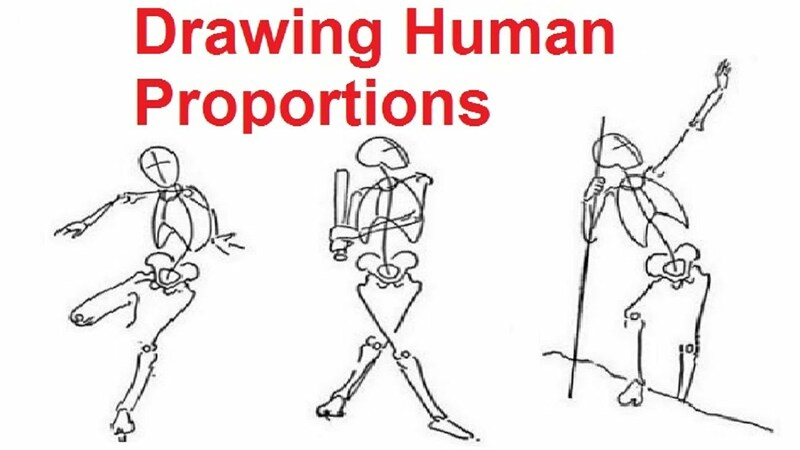 One resource I found very useful was a simple but effective video course I took years ago which helped me to understand better the fundamentals of drawing, not only people and anatomy, also perspective and composition. The lectures were easy to follow and I could feel my drawing skills were improving after each lesson. Step 1: First you gotta draw the torso, with the rib cage and the abdomen. Do not focus on muscles and focus on general shape and form. 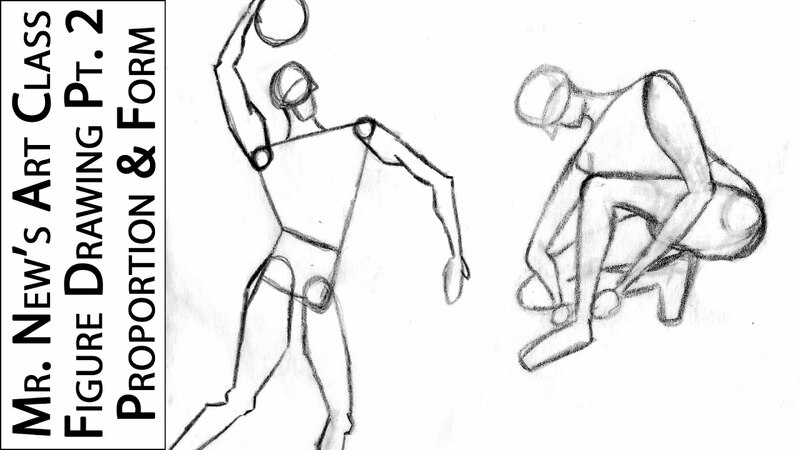 Step 2: Draw the hips. Again make it simple. You can draw this area of the body like an if it was a short underwear. Step 3: Draw the shoulders and the arms. Simple shapes like an ellipse for the shoulder, tubes for the arms and squares for the hands will do the trick. Step 4: Draw the legs. Use tubes for the thighs and the shins, and triangles for the feet. Step 5: Draw the head. You can do it drawing an ellipse and dividing the different planes of the head. Step 6: Draw the facial features. The eyes, the nose, the lips, ears, and hair. All on top of your dummy’s head. Step 7: Draw the rest of the body on top of your dummy. For the hand placed sideways, the main body of the hand will be a rectangle and the fingers again will be drawn as single squares. Drawing the hands could be somewhat challenging if the hands are open and the fingers partially or fully extended. In this case, both fists appear close in a clenching fist. The only concern here is to place correctly the knuckles and of course, don’t forget to follow the hand sketch we created when drawing the dummy. The knuckles should always be drawn on top of the fingers, with knuckle bone align with the center of the finger. 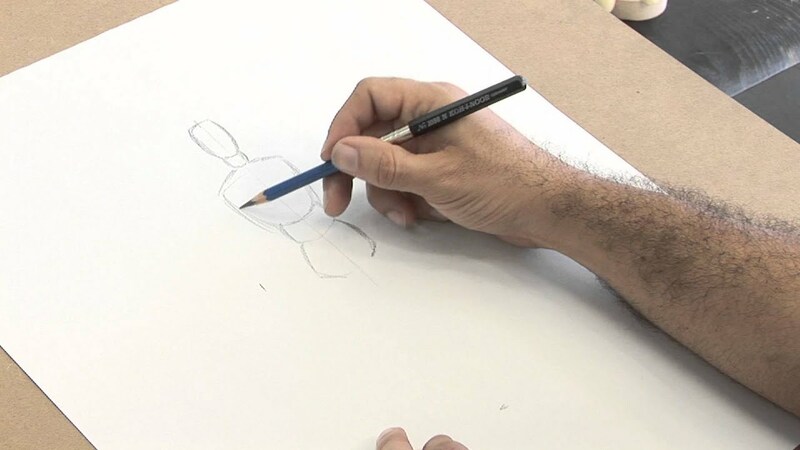 Knuckles are small joints that allow some range of movement to our fingers, so placing them well aligned with their respective finger is vital in order to draw a believable hand. The elbow will be situated on the same height of the floating ribs, on the sides of the torso. As always, I hope you found this tutorial useful. 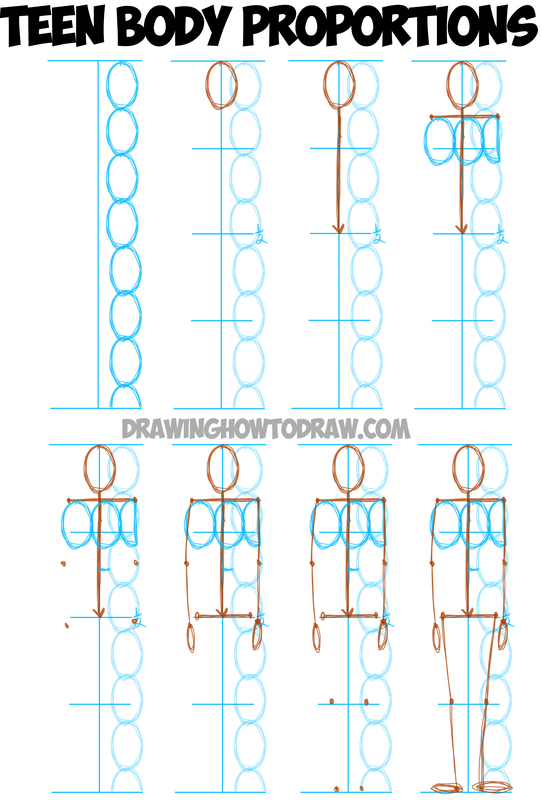 If you wanna learn more about other tutorials you can check the “Drawing Tutorials” section. 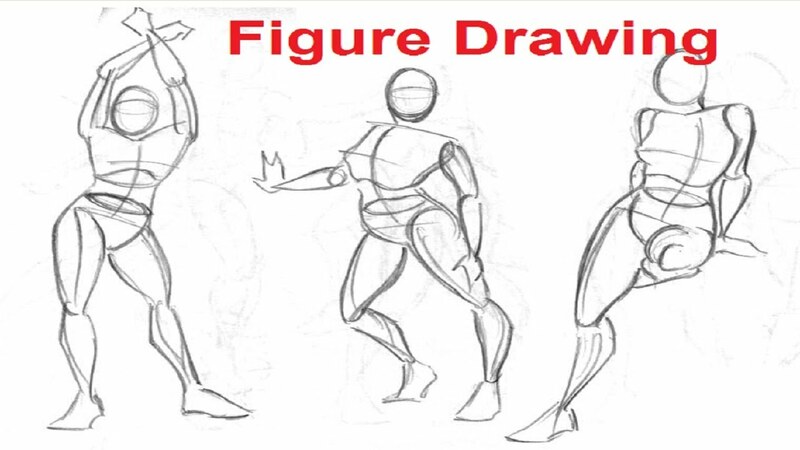 There you will find cool tutorials about drawing dragons, superheroes, video game characters, and many more. Also, if you are interested in learning how to become a professional artist, you can check my article “How to become a concept artist” where I explain the steps you should follow if you wanna pursue this career. If you are interested in learning more about drawing faces, feel free to check my step by step tutorial “How to draw Faces´´. 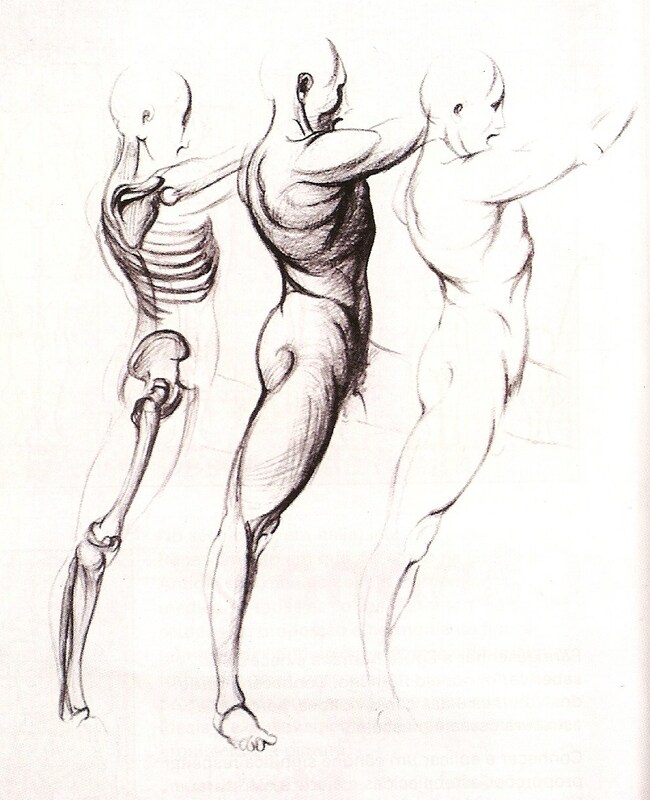 The rest of the body should not present a real challenge as long as you draw the muscles similar to what I did in the image below. As an advice, try not to draw fully the muscles. 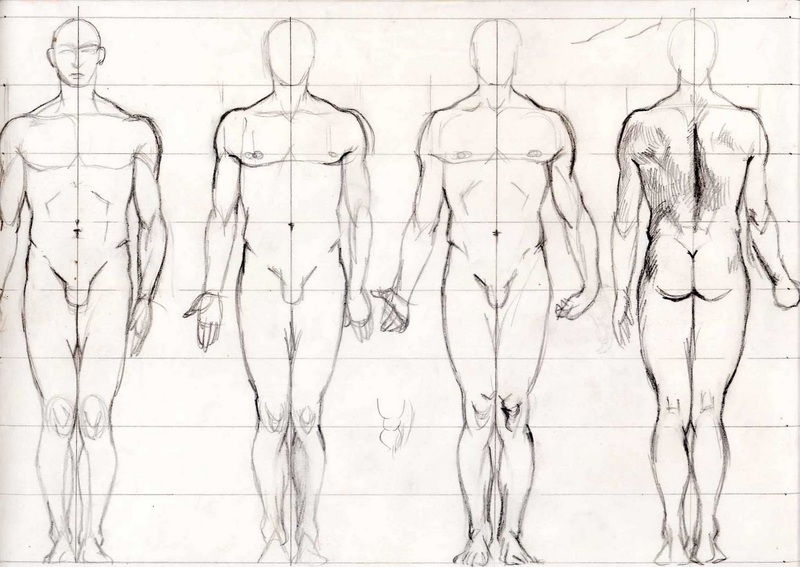 This is a typical mistake, beginner artist do when drawing the human body. I think is due to the superhero comics, where the character’s bodies appear totally ripped like if it was no skin on top of the muscles. A realistic body, even if it’s an athletic person, will have some amount of fat between the muscles and the skin. This is why you shouldn’t draw fully the lines separating one muscle or muscle groups from others. The feet will be represented as geometric shapes. The one placed frontally to the viewer can be easily understood if we draw it like an isosceles trapezoid. Finally, I like to divide the torso with a vertical line. This line goes from the neck to the hips. It is very important because it will help us to understand where the division between both pectoral muscles will be and where the bellybutton will be placed. 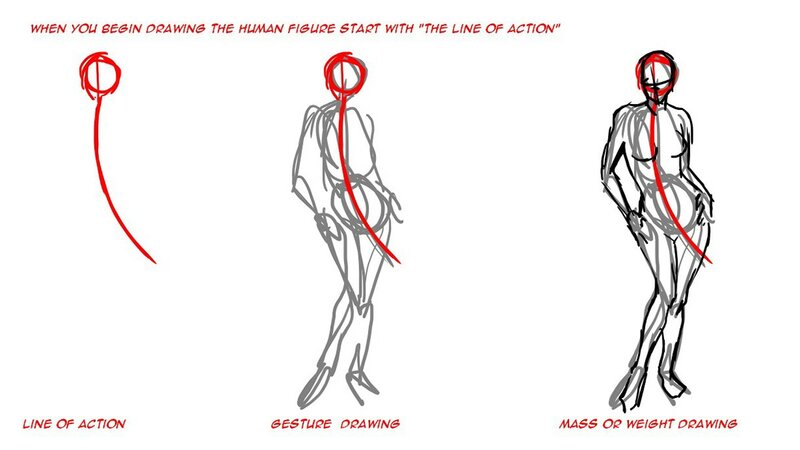 In my case, when I’m drawing the torso I’m doing it like one big part. Other people prefer to draw the ribcage first and the abdomen after. You can choose whatever method you prefer. Once I have the torso drawn, I proceed to divide the rib cage from the abdomen with a curve line. This curve line will cross the center of the torso. In his higher part will mark the end of the breastbone and the lower chest. On the sides will tell us were the floating ribs will be placed. The next chapter on our journey will be to draw the legs. For each thigh will draw a thick tube. This tube will connect the hips with the knees. The same way we did for the arms, this tubes will become narrower on the bottom area where the thigh connects with the knee. Remember the interior side of the feet is more concave in shape, and the exterior side will be more convex. In the case of the feet placed sideways, this one will be easily understood if we draw it like a scalene triangle. On top of the torso, I also draw another curve. This one will define were the clavicle will be situated. Above the clavicle, I will draw an ellipse. This ellipse will define where the neck will be placed. Welcome to this step by step tutorial. 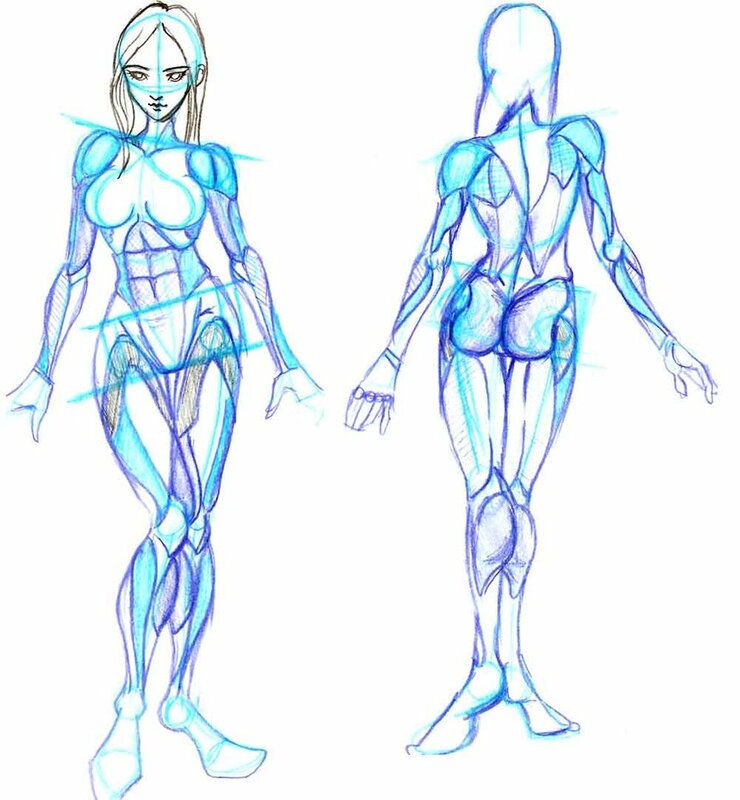 Here you will learn how to draw the human body from a 3/4 view. I choose this view because the majority of tutorials teach you how to draw a person from a front or profile view. This is useful of course, but your final drawing will look too flat and rigid. 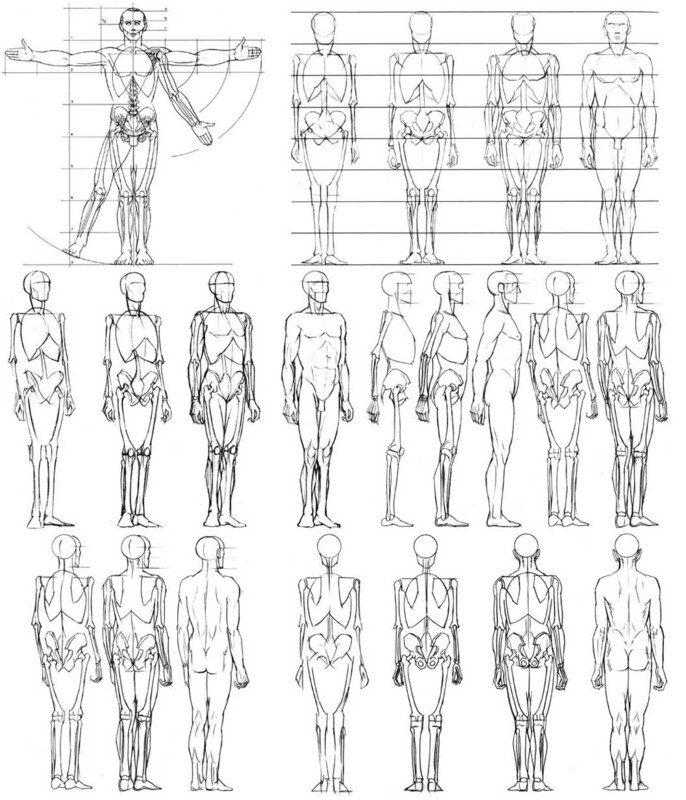 The most common view used in drawings is the 3/4, especially if you are a concept artist. This view gives a real sensation of depth and three-dimensionality to the characters. 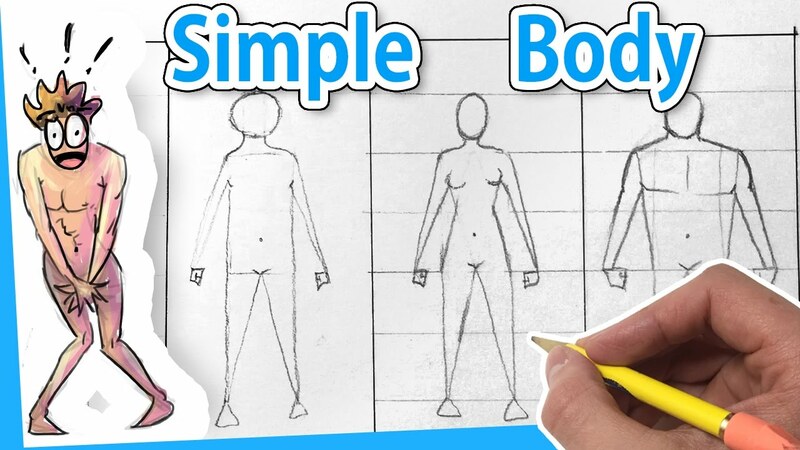 When I was a beginner artist struggling to learn how to draw the human body, I decided to search for information on the web so I could educate myself on the matter. 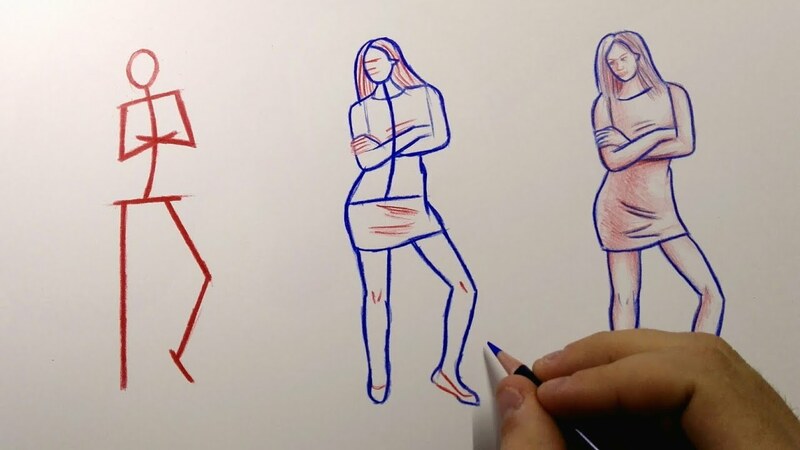 After days and days of searching, I found this video course called ” The Secrets to Drawing” and it was a game changer for me. 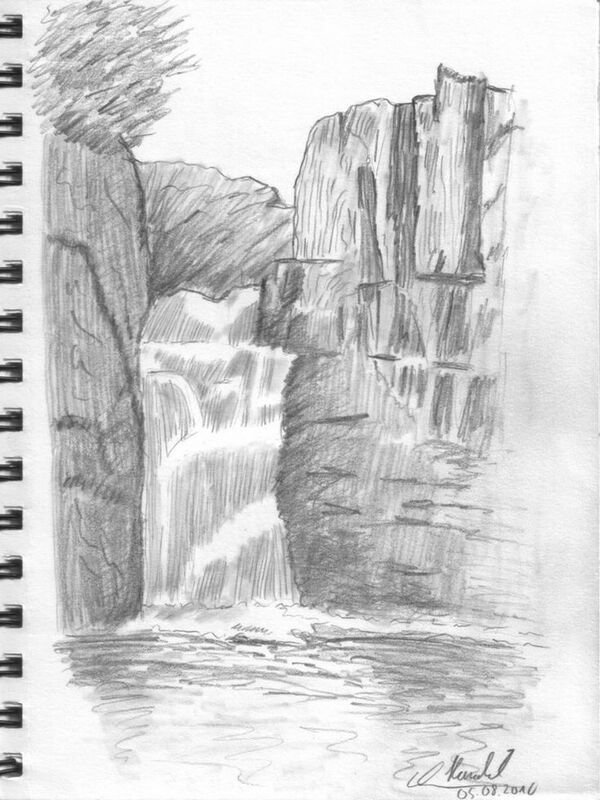 My drawing skills skyrocketed from the moment I started to apply the principles and fundamentals this course teaches. XP Pen Artist drawing tablet: Is this the best tablet for beginner artists? Once I have the torso and the hips in place, I will move forward and start drawing my limbs. 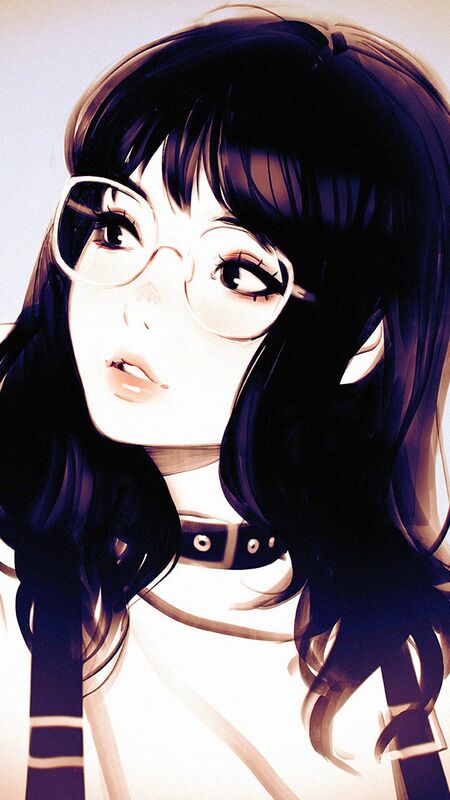 Regarding my background, I’ve been working as a professional concept artist and illustrator for the past 8 years for editorials and video game studios. Some of my clients are Games Workshop , Gameloft, Fantasy Flight Games , Socialpoint, Kunlun games and more…. Remember that the sides of the mouth will align perfectly with the center of each eye. For the head, we will draw a sphere which will represent the cranium and the face. This sphere will be placed on top of the ellipse we drew for the neck. Under the sphere, we will draw a square. This square will be the jaw of our dummy. Once we have the head placed, we will connect it to the body drawing the neck. Drawing the hips will be the next step in our journey. I usually draw the hips and the crotch like if our dummy was wearing a short swimsuit or male underwear. It simplifies the process creation and makes things easier to understand.